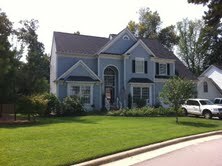 Yard of the Month for September is awarded to Rodney, Charles and Robin Markham of 2640 Iman Drive. The rich green lawn is punctuated with vibrant seasonal color along the walkway. Being a corner lot, there’s a lot more frontage to take care of. But the Markhams have done it in style, finishing in the top three for the last two months. Tied for second place are Carey Bitterfield of 8524 Yucca and David and Joan Summers of 2608 Meadow Star. For October we’ll change things up a bit and award Yard of the Month to the home with the best Halloween decorations. So have fun and get it the “spirit”. Congratulations to the homeowners and thanks to Jen Magee (also for the Halloween suggestion) and Mimi Raub who served on the judging panel.